HB 1180, HD1 RELATING TO NATURAL DISASTERS. Appropriates $60 million for disaster relief, recovery, mitigation, and remediation activities for the County of Hawaii. The Kilauea eruption covered nearly 14 square miles in Puna; it destroyed 716 homes and made over three thousand parcels inaccessible, and destroyed a school, farms, cultural sites, roadways, water systems, recreational destinations, and a large portion of the electrical grid. The state has already allocated $22 million for recovery efforts bringing the total funding to $82 million. The governor, the legislature, and the Hawaii County Council all support this bill. The bill requires reporting of monthly expenditures to the Department of Budget and Finance. HB 1488, HD1 RELATING TO THE STATE CAPITOL. Requires DAGS, in consultation with the Legislature and appropriate agencies, to develop and implement an enhanced security plan for the State Capitol. A 28-year-old man was fatally shot by a deputy sheriff on Feb. 18 during a routine patrol on the Capitol rotunda when the officer struggled with the man who may have been drinking alcohol and refused to leave the grounds. Appropriates funds to DAGS for enhanced security measures and security improvements, including vehicular barriers and to PSD to purchase or lease security screening equipment and contract private screening personnel for the State Capitol. HB 703, HD1 RELATING TO INTOXICATING LIQUOR. Prohibits any person convicted of Operating a Vehicle Under the Influence of an Intoxicant (OVUII) or Habitually Operating a Vehicle Under the Influence of an Intoxicant (HOVUII) from purchasing or publicly consuming alcohol for a probation period following sentencing or administrative license revocation. In January, a suspected impaired driver plowed into a crowded Kakaʻako intersection, killing three people. In 2018, 43 pedestrians were killed in car crashes statewide. The bill amends the sentencing requirements for OVUII and HOVUII offenses. Amends the threshold for HOVUII offenses. HB 1177, HD1 RELATING TO PUBLIC SAFETY. Appropriates funds to purchase the Honolulu Federal Detention Center. HB 1153, HD1 RELATING TO REMOTE TESTIMONY IN LEGISLATIVE HEARINGS. Requires each house of the Legislature to establish, by rule, procedures for the public to present oral testimony at legislative committee hearings through remote testimony. This will expand and encourage public participation opportunities. Appropriates funds. HB 1263 RELATING TO ORDER OF SUCCESSION. Amends the order of succession to the office of lieutenant governor. HB 1248, HD1 RELATING TO ELECTIONS. Enacts voting by mail uniformly across all counties for all elections commencing in 2020. Appropriates funds for the implementation and administration of the election by mail program. Requires the office of elections to submit a report to the Legislature regarding the implementation of a vote by mail system. HB 709, HD1 PROPOSING AN AMENDMENT TO ARTICLE II OF THE CONSTITUTION OF THE STATE OF HAWAII. 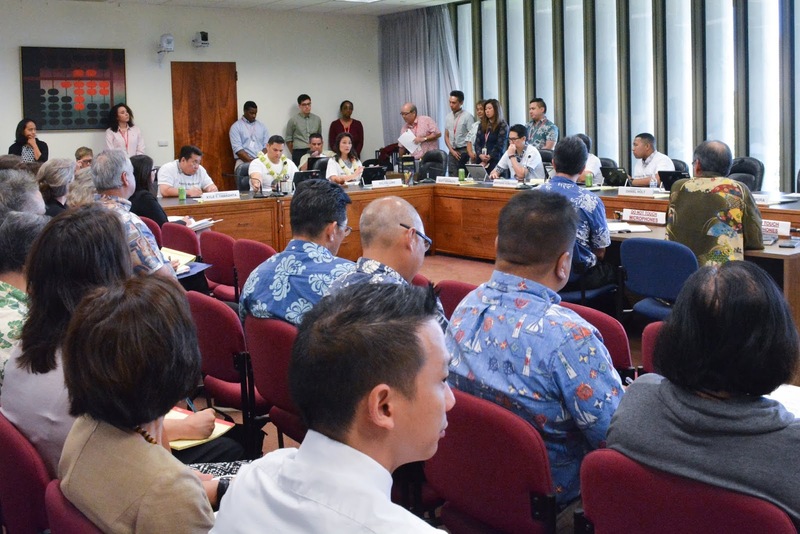 Proposes an amendment to the Hawaiʻi State Constitution to allow a recount of votes cast at an election to be conducted in a manner to be provided by law. HB 428, HD1 RELATING TO ELECTIONS. Requires an automatic recount of votes cast for a candidate or on a ballot question when the difference in the number of votes cast for the top two candidates or on the question is equal to or less than 100 votes or 0.5 percent, whichever is greater. These measures will move to a full vote on the House floor.